I had been looking forward to this meeting for weeks. We were to give tribute to one of our tribe who was leaving. She was really leaving the company, but we women had started a tribe to support one another in this primarily male work place. I was not expecting what happened at the start of this meeting. She insisted on being the first to speak as we all had our tribute words ready to send her off to greener pastures. She called my name and said “I hate you. I hate your positive attitude and I am leaving because of you.” The long silence was palpable and all I could do was leave that meeting. Somehow, I believed she was right. What did I do to cause her so much grief and pain, even though my only contact with her was these monthly meetings? I went home to use the still of silence to give me much needed answers. I couldn’t find an answer because I was too caught up in feeling betrayed. Why hadn’t anyone stepped in to defend me? It must be true. Within a few days, the story of what happened leaked out into the workplace. I received a branding of being “damaged goods”. How could that be? I was feeling completely betrayed by my tribe. Underneath my feelings of betrayal was a deep silent rage. How could someone else’s opinion change my whole image? Didn’t the work I do have any bearing on my future potential in this company? Where was this all coming from? I was feeling rage now. Digging deep into my rage, two other emotions came forward. I was feeling completely powerless. How could I undo all the damage that was done? How could I convince others that I wasn’t “damaged goods”. The other feeling was envy. I thought everyone else got breaks except me. I was somehow doomed to a life of people thinking me not being up to par. As I sat with those feelings, I realized that I couldn’t do anything about what others thought about me, regardless of the facts. I had no power there. What did I have power to do? My feeble attempts to defend myself just convinced others that it must be true. I resigned to having to leave this place, but I didn’t want to leave feeling down on myself. So where was my power, really? 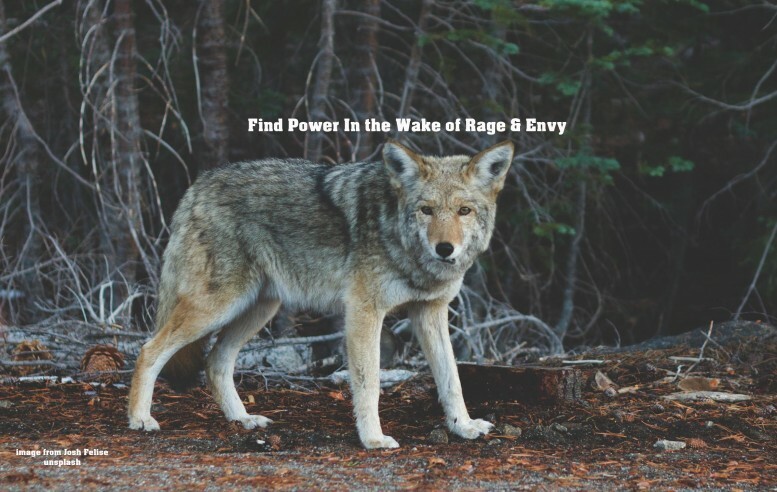 How does one find power in the wake of rage and envy? Have you ever felt powerless because of what others thought and said about you? Did you want to find some control of your life so you could feel powerful again? Down deep, that sense of betrayal by my tribe is what sparked my powerless rage. It was based on an envious belief that everyone else got a break but me. That envy kept feeding my sense of powerless rage. Did you ever feel that way, feeling singled out by the Universe? You just wanted to bust at the frustration of not having what you want, thinking you needed to convince others first. Or maybe you felt jealous, thinking because others had something and you didn’t; the Universe was unfair to you. There was a paradox here for me. On one hand, I felt completely powerless unless I had a clear sign that help was on the way. On the other hand, I knew that we are all given the power we need to face any challenge in life. Have you ever felt conflicted within a paradox? Sitting with that paradox, knowing there was some truth to both sides, I was suddenly shaken with surprise. All my thoughts and attention were focused on what I needed other people to do or believe before I could have what I wanted, just space to do my thing. I was betraying myself by giving away the power to control my life to others. I was not acknowledging any power within myself at all. Also within that paradox, I realized we are all quality goods. There is no fine print anywhere in life’s rule book exempting anyone from being who they choose to be. I made a conscious decision right then and there that I was going to be treated fairly by the Universe. I had the power to control my thoughts and what I gave attention to. I decided to own how much I was “quality goods” as everyone is. Something amazing happened after I made these new choices. I felt this deep sense of peace and that powerless feeling was gone. I had found my power in the wake of rage and envy. Within a few weeks, the truth came out. People came to realize the lady who left was jealous of me. She was leaving because she had a poor review for performance. That whole “damaged goods” label vanished as if it never happened. Sitting with paradox, then changing my mindset with new choices was empowering and produced a whole new set of opportunities. I eventually left that job for a better one and in a city I preferred to live. How do you give away your power? Are you trying to control others view of you? What others believe about you is not very important. What you believe about yourself is what will affect the rest of your life.